What Is I Ching Hexagram 47 All About? Hexagram 47 represents a phase of life when a flow of difficulties have been passing through. It is important to not sink into a hole of despair but instead work hard to encourage yourself to endure. When we are unable to overcome a difficultly, then it is easy to have feelings of depression. And suddenly, we lose the power to continue moving forward. 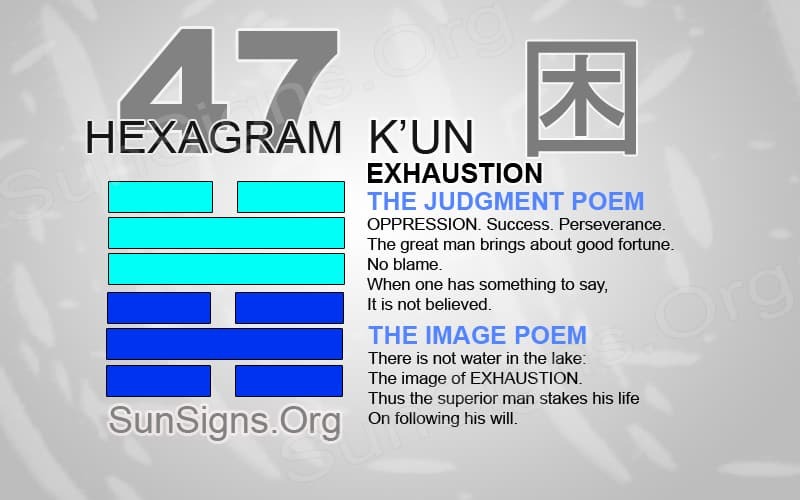 Hexagram 47 yijing warns against these feelings and reminds an individual that this too shall pass. We must be willing to endure all forms of life, both pleasant and troublesome. Preparing for these difficult times mentally will help maintain a sensation of purpose. Hexagram 47 appears to a caster when there is an obstacle or something holding a person back from succeeding personally. It is human nature to want to succeed and accomplish great things in life. It takes a lot of hard work and dedication in order to obtain success. How we act emotional is as important as the effort we make to finish a goal or complete a project. Sometimes during the life path, we find ourselves giving up on goals that we once worked hard towards finishing. There are events and external forces that act against us in order to take our minds away from gaining success. This can be something in society or we can even inflict this type of pain on ourselves. Working on a project individually calls for a form of encouragement we can only give ourselves. We must fall back into love with our work. Remember why we started on this path in the first place. There will be times when it is hard to make any sort of progress. It is at this point that it is easy to feel depressed or unsure of the personal self in order to continue on. I Ching 47 says learn to inspire encouragement within yourself, instead of searching for this renewal from others. This will guarantee an easy passage through these tough times. Find what brings you joy in order to continue striving for love in your relationships. Do not despair and give up on your loved ones. There are no accomplishments in life that will come easy. This will not end without first gaining a couple of scars in the process. Sometimes, it becomes impossible to make any progress. Take the time to step away from the project or the current plan. Do this to gain a new perspective on the work being completed. Give space between what you are working on when a road block appears. Coming back to the project after a significant amount of time can give an individual new eyes to re-look at the plan. Sometimes we miss the small details in a project and simply focus on the big picture. We can then miss small mistakes that need to be replaced. Get some fresh air or come back to the project after a few days. This can give an individual time to freshen up and renew the spirit in order to continue. Hexagram 47 will show a phase of difficulty in one form or another. But this hexagram gives wisdom on how to combat this time period. It is easy to become depressed when unable to continue working. Take the time to step away from the project in order to regain a clear head and a new perspective. Understand what will bring you encouragement to continue working hard to complete the project. Do these things often in order to regain control of the project.